Some of the regular journal topics came and went. For instance, in the late 1920s, Bais Yaakov published Yiddish translations of poetry by Rabindranath Tagore in nearly every issue, participating in the general European passion for his poetry. 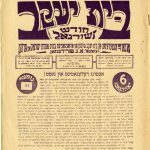 As part of the ongoing nature of the Bais Yaakov Project, we will finish uploading the print runs of the Bais Yaakov Journal though 1939, and add the print runs of the Bais Yaakov Ruf (Lithuania), Bet Yaakov (Israel), and Beth Jacob (United States). We also plan to translate the Yiddish, Polish, and Hebrew journals. If you would like to contribute your time and expertise, please contact us. Articles on the "Woman Question"